I first became interested in AstroCartoGraphy in 1986 when I had my own AstroCartoGraphy done. Then in 1988 while I was working with Matrix Astrology Software I helped to debug their version of AstroCartoGraphy which they called Astro*Maps. I have been using it since then. Relocation Astrology refers to how your life is affected by changing location. Actually Relocation Astrology is made up of two different methods which can be classified as stula (gross) and suksma (subtle). The stula method is called AstroCartoGraphy, while the suskma is doing a Prashna. The astrological technique employed in AstroCartoGraphy is at once both simple and sublime. Astrology is based upon both the time as well as place of birth. The planetary positions are calculated as a function of time, but the ascendant (rising sign) and the subsequent houses are dependent on the location. Thus, the horoscope is a unique product of both time and space. AstroCartoGraphy is a method that simplifies the selection of a location where certain astrological conditions would prevail. Instead of casting a new chart each time a person moves the computer program generates a map showing lines that signify where a particular planet is prominent in its influence. This provides a graphic tool, which the astrologer can use to guide the client in relocating or other ventures requiring geographical location. For more exact information on the effects of a place a thorough analysis of a Prashna Chart is still necessary, but the Astrocartography maps can help us in finding good places faster. And get our intermittent newsletter and updates to this site. By analyzing the client’s birth chart the astrologer can determine which planets are favorable to him and thus choose the appropriate line on the Astrocartography map. In this way the astrologer can help his client choose the most favorable place in the world to thrive. I have had authors with "writer’s block" call me to get an Astrocartography done. By looking at their birth chart and Astrocartography I would pick out a likely place where their imagination and creative juices would flow. I remember one young man who came to me for a reading in Dallas; he asked for Astrocartography to be done. I told him that the best place in the world for him would be South Western Australia, in the Perth area. He was astounded, he had always wanted to go to Australia. He literally quit his job and moved there! One traveling sannyasi (mendicant monk) was looking for an auspicious place in the world to perform his austerities. On examination of his Astrocartography in conjunction with his horoscope I concluded that Argentina would be very good for him. He told me that he consulted other reputed astrologers about my suggestions, they all said I was wrong. This sannyasi had faith in my ability, he moved to Argentina several years ago, and he reports that he is thriving and that things have never been better. I told one business man in Singapore that Greece would be very auspicious for him. We were both amazed when he told me that his sister had moved to Greece and he was interested in going there himself. The AstroCartoGraphy reading you have done for me was totally spot on. It explained my life long fascination with certain places (some very remote). It explained why I felt so good and "right" in certain places and why I get along with people from certain places. It showed why I do not feel at ease in my birthplace. I thought this was due to past life connections yet I was not able to "pin point" this on a world map. Since I love to move and travel which, at this point in time it is not possible as much, your reading will come in handy in a few years from now. Your reading did show me that having moved to another country was exactly the right move because my life has improved significantly since. I enjoyed your explanations which are very good and humorous. Thank you Shyamasundara. Relocation can be used to find better places for improved health, creativity, money, career, marriage, etc. The person may not even have to move to the location to get the benefit. It is often found that good things will flow from the favorable places indicated by the lines if the person makes a connection with that area. I note that many of my clients come from areas in the world where I have favorable lines. After finding a good general area via AstroCartoGraphy one can then narrow down the selection by using Prashna. An important thing to remember is to have realistic expectations. You take your karma with you where ever you go. So if your destiny in this life doesn’t include fabulous wealth then don’t delude yourself into thinking that if you move to another location you will become fabulously wealthy. Yet at the same time some places will be better for you and you can be more comfortable, successful etc. relative to your karmic destiny. An example of how your choice of location can affect a situation. Suppose you became ill with the flu. Where would you prefer to be? 1 safe at home in comfortable surroundings with loving caretakers. 2 trekking across the Polar icecap alone in -50C weather followed by polar bears. In both conditions you are sick but the location will probably determine if you survive. Always remember that choosing a location is an act of freewill that you make to maximize an outcome. But it cannot give you what you are not destined for. There is no where in the world that a man blind from birth can move to and regain his sight because that is not his destiny. What you get: a general description of the positive and negative effects of all the planetary lines. Then based on your particular chart we recomend which are the best planets for you. From this we give you a report in the form of a MP3 recording suggesting which areas of the world would be best for you. Example of an AstroCartoGraphy map. I want an AstroCartoGraphy reading. 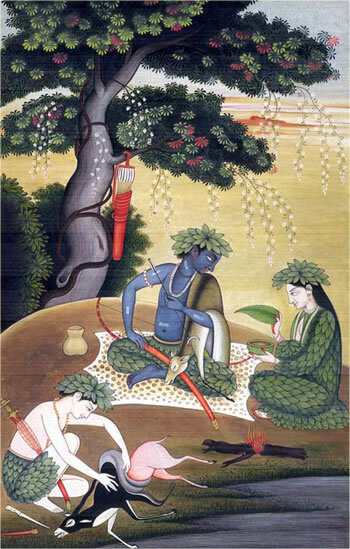 In this scene from the Aranya khanda of Sri Valmiki Ramayana we see Sita Devi with Her husband Lord Ramacandra and His younger brother the valiant Laksmana. 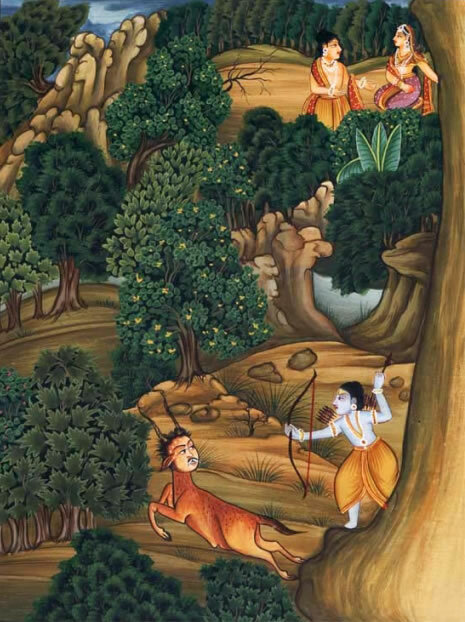 By the arrangement of providence Lord Rama was exiled to the forest for fourteen years by His father the Emperor Dasaratha in order to keep his promise of giving a boon to his favorite wife Queen Kaikeyi. As her boon she demanded that Rama be banished and her son Bharata the younger brother of Rama become Emperor instead. Lord Rama, the paragon of virtue, obeyed His father so that His father's word of honor would be true and left for the forest. His devoted brother and chaste wife followed him. While in the forest they met exalted Rshis like Baradvaja and Agastya and asked them where would be the most auspicious place for Them to set up Their ashrama while in the forest? They were directed to reside in the beautiful place called Pancavati. Since They played the part of the warrior caste as part of Their dharma They were allowed to eat the meat of deer They killed and use the skins for covering. Rama is lured away from Sita so that Ravana can kidnap her.